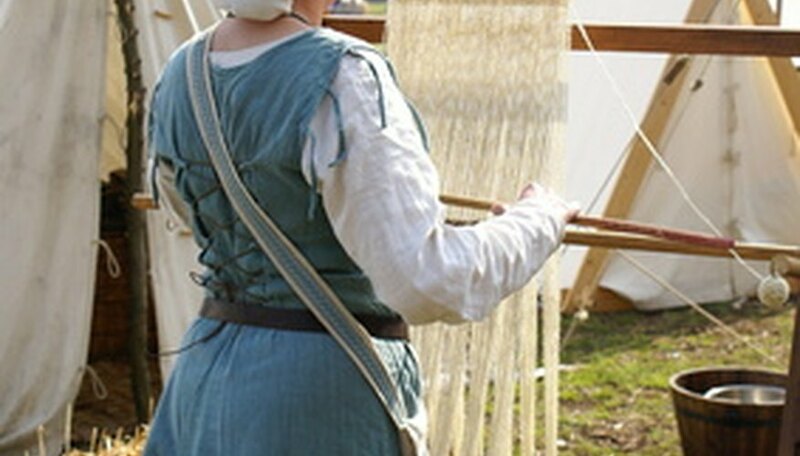 Weaving has been a necessary pastime ever since we graduated from using animal skins for clothing. Handweaving is usually a hobby today, but it can be very expensive to start. Even a small wooden table loom costs several hundred dollars. Making your own loom from PVC is an inexpensive way to learn the basics of warping and weaving before you decide to spend a lot of money on a tool that may be too complicated for a beginner. Measure the 10 foot section into two 20" pieces, three 14" pieces, one 13-3/4" pieces, two 8" pieces and two 2" pieces. Mark each section with a pencil. Cut the pieces using a PVC pipe cutter or a small hack saw. Lay out all your pieces in an organized manner, grouping similar pieces together. Label all pieces as you go. For the side bars, connect a 20" piece to an 8" piece to form one long piece using one ¾" tee. Repeat this to make the second side. For the top bar, select one of the 14" pieces and put a ¾" elbow on each end. Attach your top bar to the two side bars by attaching the open sides of the elbows on the top bar to the 8" pieces on your side bars. The cloth bar will close up your "U" shape. Use the 13-3/4" piece of PVC. Attach one 1" x 1" x ¾" tee on each end, inserting the pipe into the ¾" openings. If you chose slip tees instead, put the pipe into the connection opening in the tees. Attach the cloth bar to the open end of the side bars by sliding the ends of the sides into the 1" holes or by clipping the slip tees onto the sides. For the bottom frame bar, use one of the 14" pieces of pipe. Attach one ¾" tee on each end. Attach the bottom frame bar to the open ends of the side bars. This bar will keep the cloth bar from sliding off. For the feet, attach a 2" piece of pipe into the bottom of each tee at the bottom of your loom frame. Insert an 8" piece of pipe into each side of a ¾" tee. Repeat for the other side. Attach these feet to the 2" PVC pieces sticking out at the bottom of your loom frame with the central hole in each tee. Rotate the feet so they are at right angles to your frame. Set the loom upright. For the heddle frame, attach the remaining elbows onto the two remaining 2" pieces of PVC. Put the other ends of these 2" pieces in the tee located in the middle of your side bars. The openings of the elbows should be facing each other. The final 14" piece of PVC is your heddle bar. Set aside until you are ready to warp your loom. Push on each joint firmly to make sure your loom is sturdy.